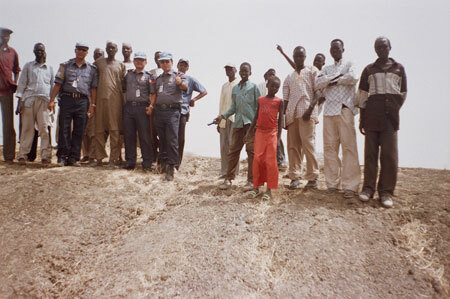 Two U.N. guards who accompanied Moro during his research and locals from Pariak at the edge of a water reservoir. Road builders funded by the oil companies excavate large areas such as this to drain the roads during the wet season and also to form a reservoir of water for local people during the dry season. They are known in arabic as hafir. Morton, Chris. "Hafir at Pariak" Southern Sudan Project (in development). 03 Jan. 2006. Pitt Rivers Museum. <http://southernsudan.prm.ox.ac.uk/details/2007.137.71/>.